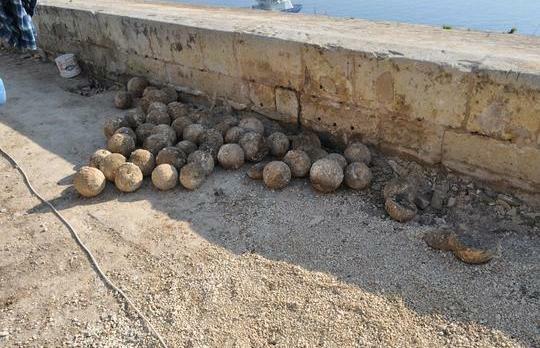 A large find of stone cannon balls was made today at the Saluting Battery at the Upper Barrakka in Valletta during excavation works. The cannon balls are made from hard stone and measure between six and 13 inches, Fondazzjoni Wirt Artna said. Some 100 cannon balls were located. "They may well be the same cannon balls shown in old snapshots of the place, which were used to decorate tree holes and the perimeter of the Lt-Col Henry Anderson-Morsehead monument," the foundation said. Following appropriate examination, treatment and cleaning they will be returned to the Saluting Battery for eventual display. The Saluting Battery is undergoing a complete overhaul that will see it being water-proofed to stop storm water filtrating down into the underlying War Rooms at Lascaris, also managed by FWA. All work is being done by the Ministry for Resources and Rural Affairs through its Rehabilitation Projects Office. The project is part-fund by the Malta Environment and Planning Authority through their Environment Initiatives Fund. The Saluting Battery was returned to its original use in 2004 as a result of a joint-project between Fondazzjoni Wirt Artna and the Malta Tourism Authority. A noon-day gun has been fired from the place ever since, recreating the age-old tradition when different moments of the day were announced with gun fire. Because of the works, the noon gun is presently being fired daily from the upper tier of the Barrakka.